11 July 2012: I was talking again to Professor Hasan from Finland, and discussing simulation again. My recent model was based on data obtained from my meters, but what about working up a model based on generic climate data of this region? We have FLUENT in the department, but it's used only by PhD students, or Masters specialising in that topic. For the time being, I am happy to write my own software using the GDL language. I will ask about using FLUENT some time during the vacation. There is also the question of finding reasonable weather data. There is a marvellous website, http://www.degreedays.net/ that seems to provide access to weather data all over the world, and offers it free for the last three years. It is possible for commercial outfits to pay a bit and have data going back further. It can be used to derive data for heating and for cooling. I recently used it for some weather data in Singapore, where cooling is the only consideration. Degree Days are based on air temperature, so a bit of sunshine is a bonus! I am grateful to the site operator who, a while back, upgraded my access level for a week to enable me to download data for the last Ten years, and I was able to check out climate records for New York, Nottingham, Abu Dhabi and Singapore, where my students are designing. I suggest that the natural rate of discharge and recharge of the ground is partially influenced by air temperature, and not solely by solar capture. Many areas of ground (e.g. woodland or urban areas) manage to recharge even if the ground does not have direct sunlight, although it's still a slight wonder to me how this happens. One has to think not in years, but in decades, of the slow transfer of heat downwards. The heat coming up from the magma is very very small, but it must have a small stabilising effect deep down. Undergrowth and vegetation are thin in winter and provide less insulation, but perhaps allow winter sunlight to have a beneficial effect when it happens. Measuring air temperatures at the moment, they are consistently 15º or 16º at about 11pm, even though we have been having such a rainy few months - the air temperatures have been good even if the general outlook is damp and miserable. The graph above demonstrates the Degree Days Below and Above 12ºC, which indicates how many months or days in which the air temperature is able to help raise or lower the ground temperature. 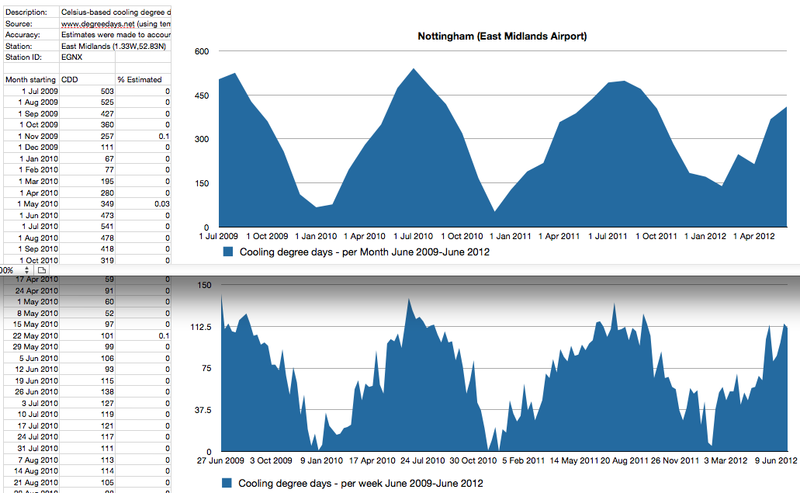 in Nottingham over the last three years, the DDs when colder than 12º are twice those when warmer. Where the graphs overlap you have diurnal conditions, where there are warm days and cold nights. I know that in Scandinavia with colder winter air temperature there are more ground source heat pumps than in the UK, but with their steeper sun angles (but longer days) in Summer, it's still a wonder how enough heat gets down for the GSHPs to bring back up (unless you charge it actively with solar heat). Top: Monthly intervals, Bottom: Weekly intervals. 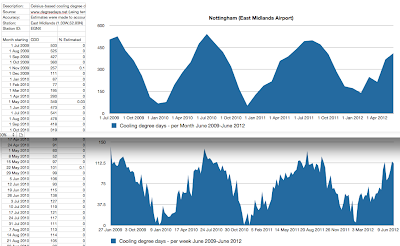 This diagram is of Degree Days (cooling) in Nottingham with a Base of Zero, for the last three years. 'Cooling' means that it shows when there is greater warmth in the atmosphere than Zero. The curve look remarkably similar to my recharging graphs in the model - a steep fall-off in winter, followed by a longer, climb-out in spring and summer. The various ups and downs in the model help me to remember past weather events, such as the 2 winters of 2010, the mildness of 2011, the mini winter in Feb 2012, and the two one-week-summers of Mar and May 2012. The final spike in 2012 indicates that air temperatures are at least warm, even if conditions are miserably rainy. Thankyou for your kind comment. I promise to maintain the blog. Next project is PVThermal!